Emotionally intense–not for the faint of heart. 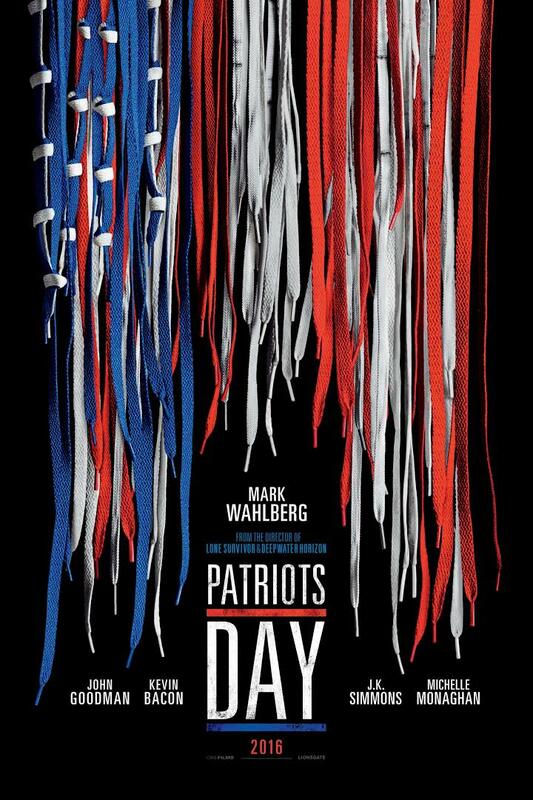 Patriots Day is the dramatic account of the Boston Marathon Bombing and manhunt for Dzhokhar Tsarnaev and his brother Tamerlan Tsarnaev. Starring a powerhouse cast on top of extensive research, this film couldn’t come at a better time when there exists such a low general public opinion of law enforcement. Boston Police Department (BPD) shines as it shows that law enforcement officers and officials truly care about the city they are responsible for protecting. Although tragedies often are more conducive for a documentary film, writer-director Peter Berg combines the information found in a doc film with cinematic storytelling techniques to successfully construct a narrative that will rock you to the core and keep you on the edge of your seat. With the inclusion of first person, news, and surveillance footage, Patriots Day does not shy away from the visceral horror that befell the City of Boston and surrounding areas. You think you may know the story, as I did, but nothing will prepare you for coming face to face with one of the most tragic events in modern U.S. history. Ordinarily, this is where I summarize the plot; but the plot is mostly known all too well. Fortunately, this film goes beyond the news reports and constructs a diegesis (story/narrative) around the stories of eye-witnesses, victims, the wounded, medical first responders, and law enforcement–both local and federal. Mark Wahlberg, John Goodman, Kevin Bacon, J.K. Simmons, and the rest of the principle and supporting cast deliver outstanding portrayals of the real men and women who were instrumental in the response to and apprehension of the bombers as well as those who fell victim to the arson and shrapnel. It isn’t often that films depicting tragedies are produced this close to the events contained therein. Occasionally, there are films about tragedies that are truly better suited for a documentary; but, in order to convert it to a cinematic motion picture, a love story is added for diegetic affect. That is not the case with Patriots Day. The focus is on the BPD, FBI, and medical first response to the bombing and massive manhunt that ensued immediately after the explosions. There are certainly romantic relationships indirectly connected to the narrative, but they are mostly included to juxtapose the everyday life that everyone thought they were going to have on April 15, 2013 against the horrifying events that transpired at America’s longest running marathon, which has become such an iconic event each year. Logistically and diegetically, there is a simple answer as to how this tragedy was so successfully translated to the silver screen so close to the day it occurred whereas other tragic events (mass shootings, bombings, aero-spacial, maritime, etc) are more conducive for and translate to a documentary better. This tragic event is a combination of (1) the explosions themselves (2) the manhunt afterwards and (3) the impressive work of law enforcement. There is more to this story than the bombing itself. Certainly the bombing was the catalyst for the events that ensured afterwards, but the real story is of the incredible actions of law enforcement and other first responders. While there seems to be a general focus in broadcast news media on the negative actions–whether perceived or otherwise–of law enforcement officers, this powerful film shows police officers in a positive light–shows them as individuals who love the city under their protection and stop at nothing to protect the innocent. This is so important in today’s climate of scrutiny of public safety officials. The cinematography, visual effects, and production design are flawless. So incredibly realistic that you will likely feel transported from your seat into the film itself. To my surprise, the film included interviews with key figures directly involved with or affected by the Boston Marathon Bombing. It’s not uncommon to include photos with textual exposition on the lives of central figures in a historical film; but this film goes beyond telling you “where they are now” or what happened after the events in the film. It includes video footage of interviews–you get to hear from the individuals upon whom the characters were based. I could not think of a better ending to a film such as this one. Patriots Day works because it is the best of what a documentary offers with the brilliance of cinematic storytelling techniques. For those of you who appreciate historical films depicting tragic events, then this is one that you need to watch. It is not a film to be enjoyed in the conventional sense, but one that packs a powerful message and neither glorifies nor undermines the real historic event. Such a visceral film. Rated R for adult language.